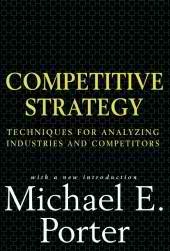 Michael E. Porter is probably the most respected expert on business strategy and the competitiveness of nations. He is prolific author, having published 18 books and over 125 articles. His ideas, methods and tools are taught in business schools throughout the world. Michael received an engineering degree from Princeton, an M.B.A. from Harvard, and a PhD in business economics from Harvard. He assists governments throughout the world in economic policy. He is a founding member of the Executive Committee of the Council on Competitiveness, America's leading private-sector competitiveness organization. Primary processes provide direct value to the customers. Secondary processes support the primary processes (e.g., HR, IT, Accounting). Organizations should ensure that their processes are integrated and optimized to deliver desired results to customers. Industry attractiveness: An attractive industry will yield a high return on investment. Customers and suppliers will only have moderate bargaining power and there will be few substitute products. Typically entry barriers will be high in an attractive industry. Cost-of-entry:Is the cost of entry too high, so a good ROI is impossible? Better-off: Will the acquisition give an advantage to acquirer or the acquired? Product Differentiation: The process of distinguishing a product or offering from others, to make it more attractive to a particular target market. Market Positioning: The process of developing an identity in the minds of their target market for a firm's product. What must be (versus what is) the extent of market presence in the world's major markets? How to build the necessary global presence? What must be (versus what is) the optimal locations around the world for the various value chain activities? How to run global presence into global competitive advantage?